By Jack Hauen · Jan. 7, 2015, 12:42 p.m.
It’s time to get off the couch. Lucky for you, we've compiled some information to get you started on your fitness resolutions. By Jenny Tang · Jan. 11, 2015, 3:12 p.m. The hockey team finally broke their long-term losing skid after dominating the Mount Royal University Cougars in a 3-1 win, followed by a 4-0 shutout. By Olamide Olaniyan · Jan. 11, 2015, 3:53 p.m. The sound of numerous volleyballs making contact with the wooden floor echoed loudly across the War Memorial Gymnasium. By Jack Hauen · Jan. 12, 2015, 5:02 p.m. Your best bet for heavily biased, knee-jerk sports coverage lies with our panel of editors. By Jason Yee · Jan. 13, 2015, 11:45 a.m. In order to write this article, I had to seek out the guy on my team with the “silkiest mitts”, as they say. By Natalie Scadden · Jan. 14, 2015, 1:48 p.m. The "UBC Winter Classic" is attempting to set a new attendance record (1,012) for a Thunderbirds hockey game this Friday night. By Jack Hauen · Jan. 18, 2015, 4:21 p.m.
Over three thousand students showed up, hockey veteran and novice alike, to experience Canadiana in its truest form – a hockey game in your hometown. By Jacob Gershkovich · Jan. 18, 2015, 4:28 p.m. 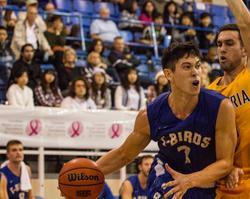 The UBC men’s basketball team looked to start 2015 off right with a couple of wins over the struggling University of Brandon Bobcats. By Jacob Gershkovich · Jan. 21, 2015, 12:17 p.m.
By Natalie Scadden · Jan. 21, 2015, 9:54 p.m. Spoiler alert: there are LOTS of varsity athletes in the School of Kinesiology. Because, sports! But what else are they into? By Jack Hauen · Jan. 25, 2015, 3:33 p.m.
By Bill Situ · Jan. 25, 2015, 3:36 p.m. Participants and staff had a night filled with enthusiasm, action, and excitement at the 2015 Winter Futsal Classic.